Picked up this one from the post office after work today. 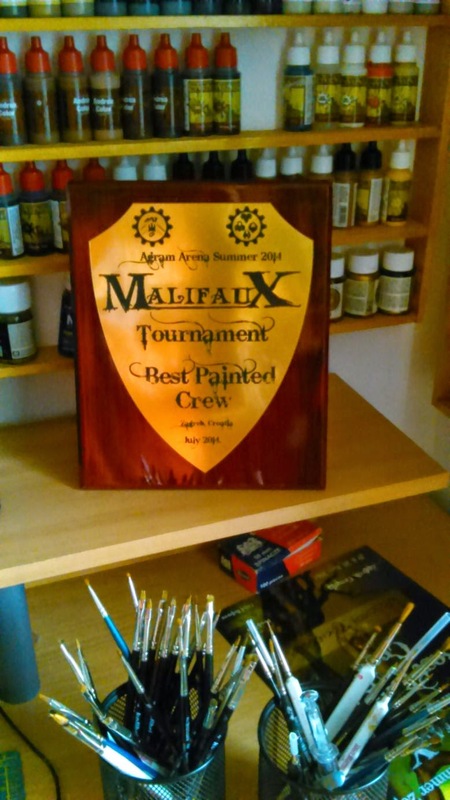 It's an award for best painted crew I won during this year's Malifaux tournament run by UMS Agram in Croatia. Technically, I wasn't there but a buddy of mine was playing using a Dreamer crew I painted a while ago and sold to him. He was kind enough (cheers Marko!) to put it up for Best Painted Crew award (players' choice). The plaque is absolutely amazing, I love the professional look. At the moment it's proudly standing on my desk but I may end up hanging it on the wall in the future. Once again, many thanks to UMS Agram, and to Marko, its president, in particular. This means a lot to me. You guys are awesome! I love the reflection of the brushes on the plaque. so befitting! W końcu znalazłem wiaderko internetu, żeby tu zajrzeć i jestem bardzo mile zaskoczony. Nazgule i Transporter z Warhammera najbardziej mi się spodobały. Jest Pan świetny :D Post Scriptum Dobra muzyka.